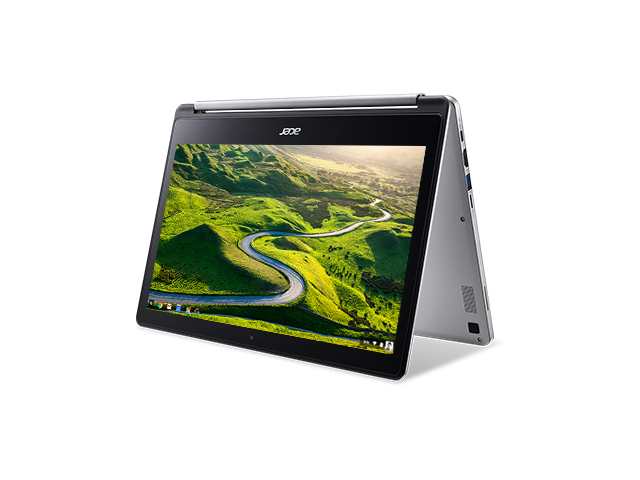 Model: The Acer Chromebook R13 CB5-312T-K1TR is a convertible laptop with a touchscreen and a 360-degree hinge that allows it to be used as a tablet. It also has commendable long-lasting battery life, a stylish aluminum lid and plenty of ports for connecting peripherals. A user also gets streamlined access to Google Docs, Gmail and the Chrome web browser, alongside a handful of Android apps from Google Play, too. The Acer Chromebook R 13's aluminum chassis gives it an eye-catching look. Its 1080p display rotates to laptop, display, tent and tablet positions on a pair of hinges that offer enough tightness to keep it stable. The Chromebook R 13 weighs 1.45 kg (3.2 pound) and measures 1.52 cm (0.6 inches) thick. One of the biggest differences between the R 13 and other Chromebooks is that it's one of the few models, along with the Asus Chromebook Flip, that can run Android apps. The Chromebook R 13's 13.3-inch, 1080p panel shows crisp images but with unimpressive color and brightness. The Chromebook R 13's panel displays only 64 per cent of the sRGB spectrum. The Chromebook R 13's panel emits up to 254 nits (a measure of brightness), which is more than the average for thin-and-light notebooks (244 nits). Since it’s an IPS-type screen, viewing angles are decent, with only slight discoloration at the edges. Powering everything is a 2.1 GHz quad-core MediaTek M8173C CPU, with a 1 MB cache and 4 GB of RAM. The R13 is a Chrome OS laptop, and therefore a workhorse designed mainly around Google’s free office suite, Google Docs, Gmail, and the Chrome web browser. For the kind of work, a user will be doing on the Chromebook R13, this will provide more than enough power. Overall performance feels smooth and stable. On paper, a user gets 64 GB of storage, but from fresh that’s actually closer to 45 GB. Since the majority of work will likely be stored on Google Drive, this won’t be an issue. However, users will want to sync files with Google Drive at some point, and here overall performance will be dictated by the quality of internet connection. Acer placed the R 13's USB Type-C port, HDMI port, USB 3.0 port and microSD card reader on the Chromebook's left side and the headphone jack and lock slot on its right side. That Type-C port is used mainly for charging, but it also supports USB 3.1 data transfer and DisplayPort monitors. The Acer Chromebook R 13 is a very good piece of hardware for the price, and the combination of Android emulation and a long-lasting battery makes this convertible a seriously compelling option. Productivity users or heavy multitaskers should consider a Chromebook with a more powerful processor, such as the Lenovo ThinkPad 13 Chromebook or the Dell Chromebook 13. However, if a user wants a convertible Chromebook for a great price, the Chromebook R 13 is their best choice.